Thank you for adding the notes section to the new version. It was well needed. I use this app frequently and appreciate that I can easily resize the recipes. I’ve been able to get around the lack of %s by starting a recipe at 100 ounces and then changing the final amount once the %s are right. When the app gets the %s option without this workaround, my soap app life will be complete. This app is a dream come true for soapers. We’ve tried several different notecard, file & recipe apps for our soap recipes but have been frustrated by the inability to really customize our recipes & their specific oil combinations. 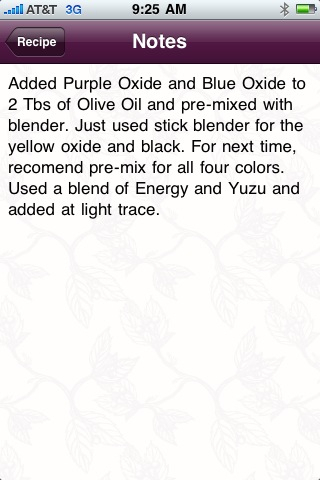 This app has tons of oil choices for formula building and even allows us to choose our superfat %. Would love to have room for additional notekeeping but awesome as is. Buy it! You can buy the App HERE. Next Post: Cuteness Alert: New Soap Molds! Yup, need an Android one here as well! Yeaaa me to, i finally got an IPhone! !